I’ve really wanted to make something with quinoa for quite some time now, and I finally did. 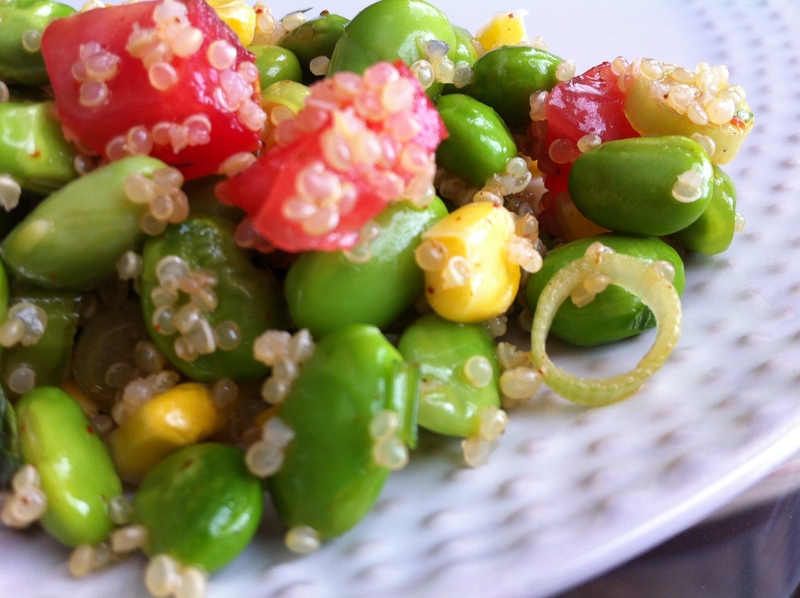 I adapted this quinoa, corn and edamame salad to make it more appetizing to me (lose the peppers and add tomatoes!). Boil and then cool the edamame and corn. 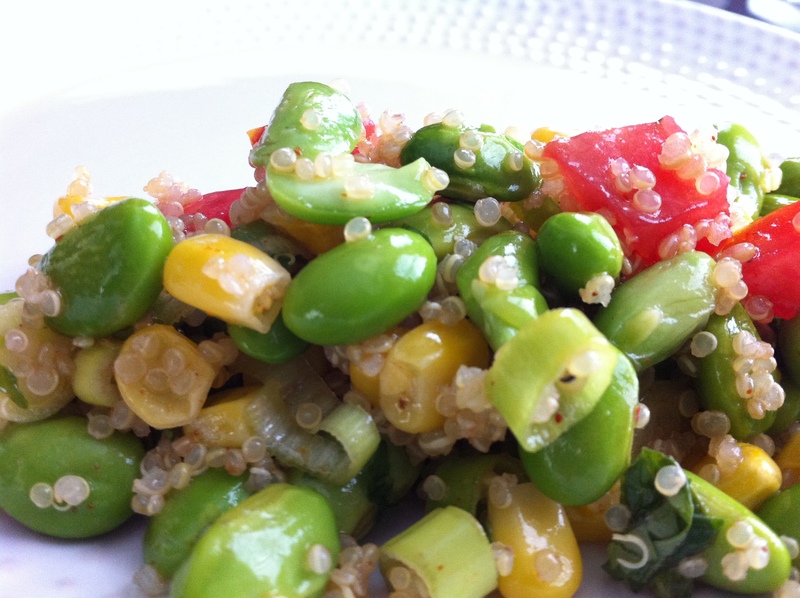 In a big bowl combine edamame, corn, quinoa, green onion, tomato and cilantro. In a small bowl, whisk together the rest of the ingredients. Drizzle over salad and toss. You can eat it right away or cover and chill. Mine kept for a few days. It’s really good and extremely healthy — packed with low fat protein! I love tomatoes. They may be my favorite food. One time a doctor told me I may have to avoid acidic foods like tomatoes and I almost started crying. Turns out I didn’t need to after all, thank goodness! 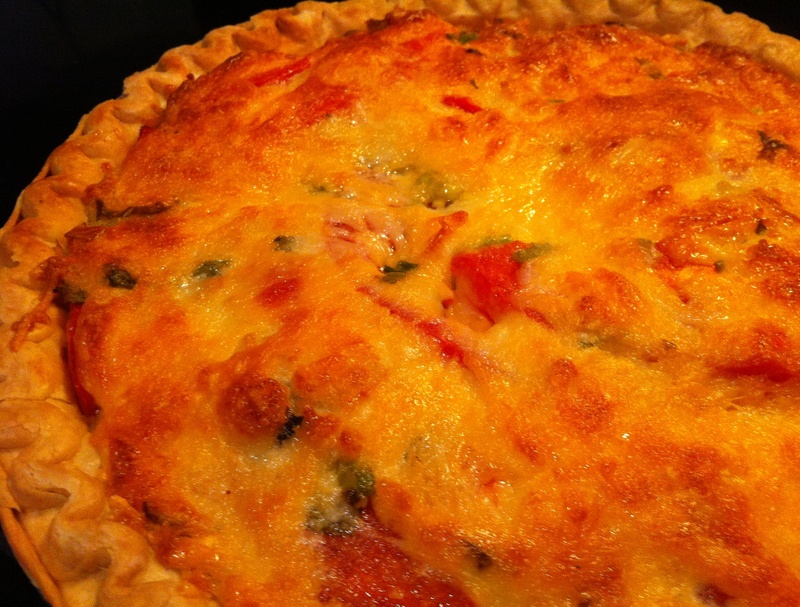 This time of summer usually brings a bumper of the fruit so I opted to make a tomato pie. I’ve made them in the past but I wanted to try out a new recipe. This year I tried Paula Deen’s version and it did not disappoint. 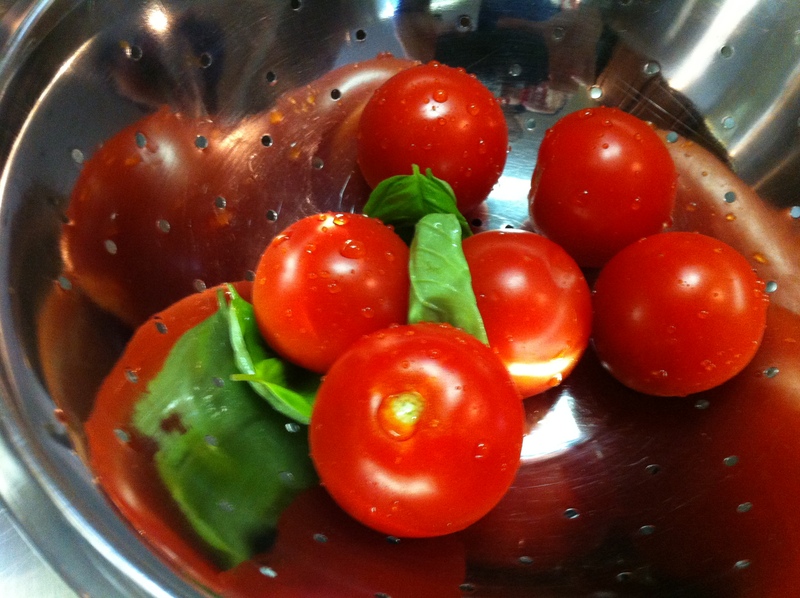 Slice the tomatoes and place in colander in sink. Sprinkle with salt and allow them to drain about 10 minutes. 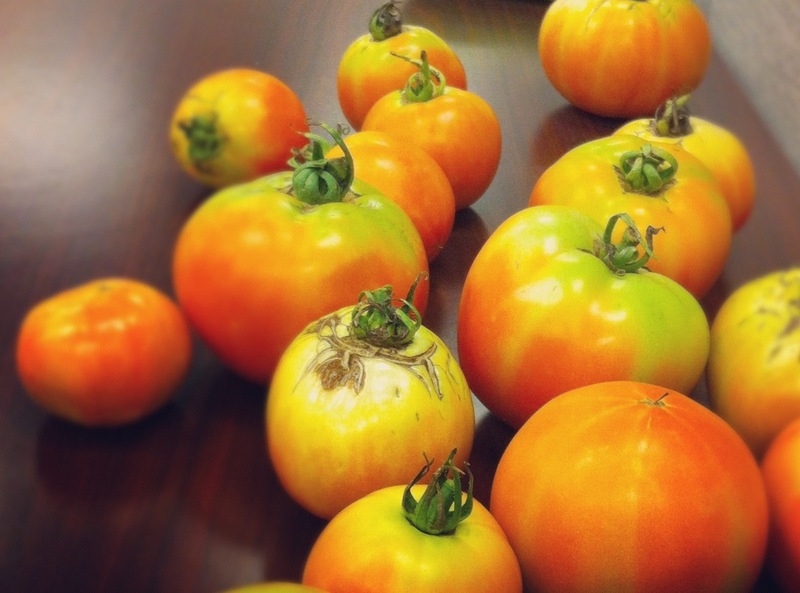 After that, I still had pat down the maters with paper towels to sop up some more juice. This is to help keep the pie from being so runny. 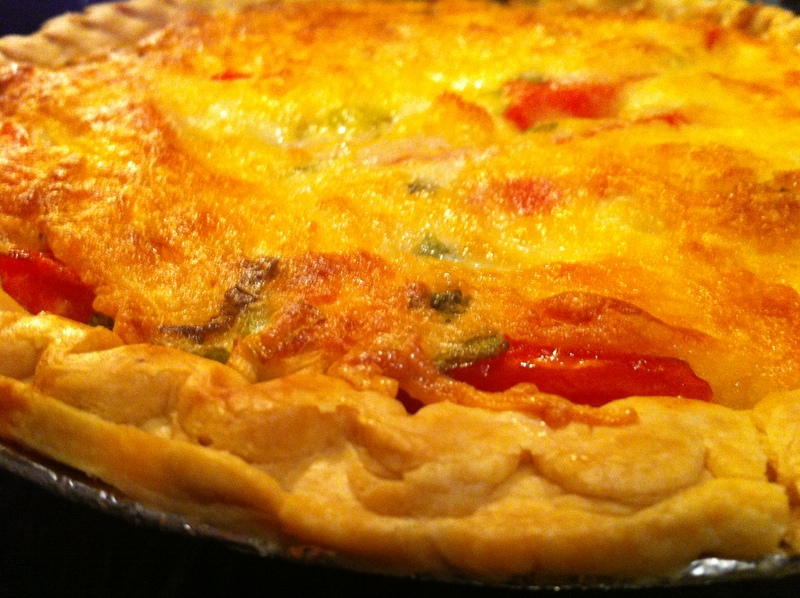 Layer the tomatoes, basil and green onions in the pie crust. Sprinkle with salt and pepper. In a bowl, combine mayo and cheeses. Spread the mixture on top of the tomatoes. Bake for 30 minutes. I put the broil on for just about 5 minutes to get my crust darker. Like most gals, I occasionally browse pinterest for inspiration. I ran across these Mozzarella and Basil Tomato Packets just in time for my Book Club meeting last month. My basil plants are doing well this year (first time I’ve been able to grow them from seed!). It wasn’t quite tomato season here yet so off I went to the store for those and marinated mozzarella balls.The original post uses grape roma tomatoes but I found some sweet little tomatoes that I was drawn to at the grocer so that’s what I used. Wash tomatoes and basil. Half and hollow tomatoes. Roll up and slice basil. 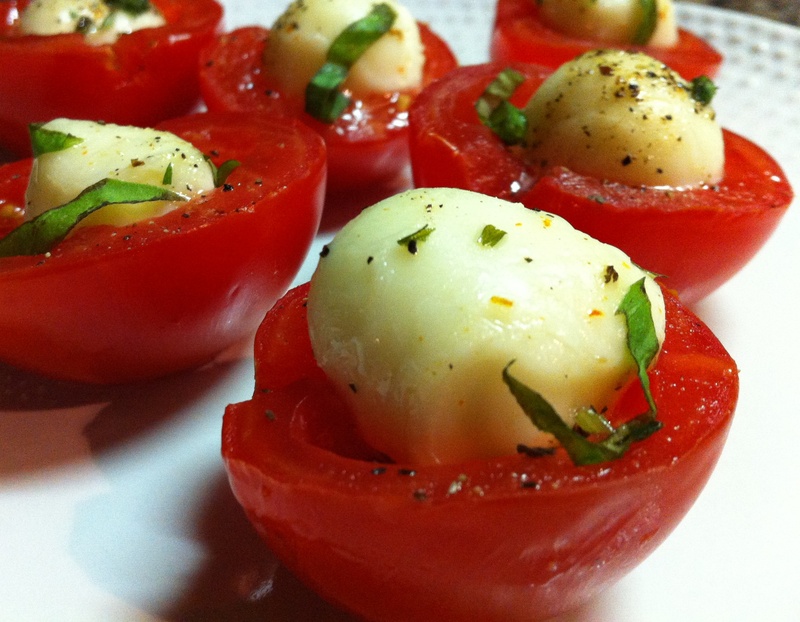 Place either an entire mozzarella ball in the tomato, or cut to fit. These were a perfect fit. Top with basil slivers and drizzle a little bit of the mozzarella marinade on top. Salt and pepper to taste. While I may copy her post, I did make this recipe my own. 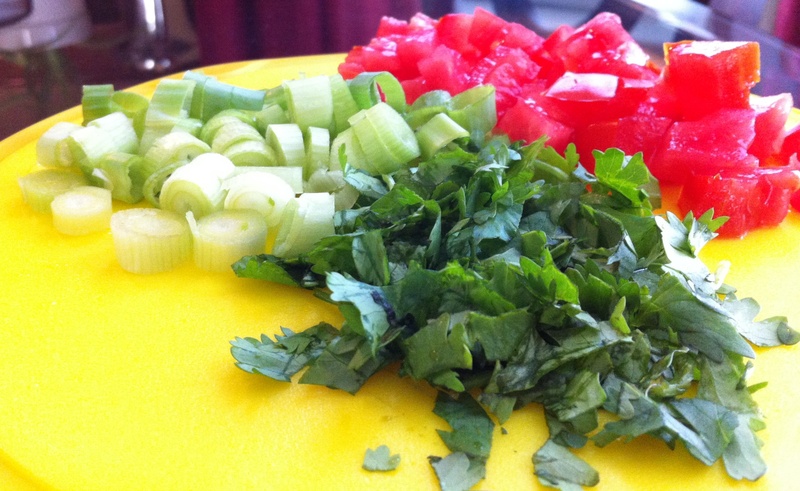 The rainbow of healthy ingredients! In large pan, heat olive oil over medium. Swirl in the spices. Stir in the chickpeas. Cook for about 10 minutes until they brown. 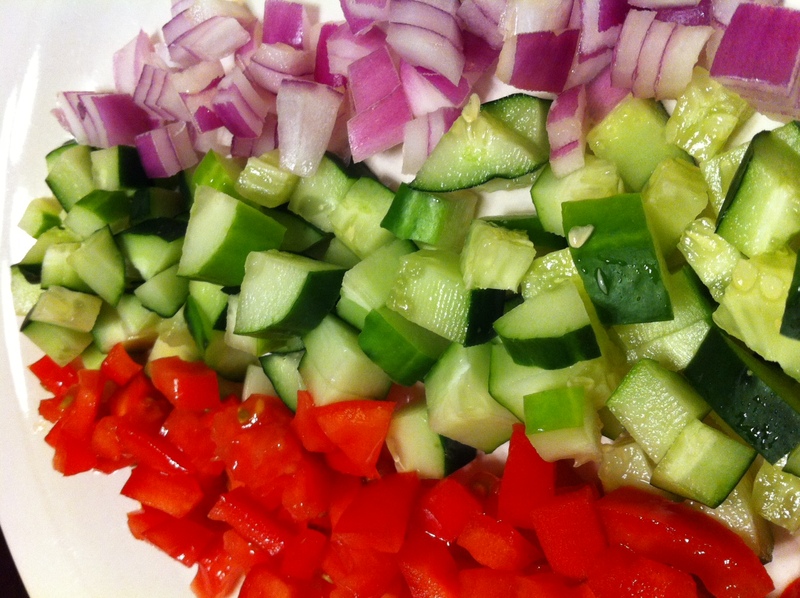 Divide and assemble lettuce, tomatoes, cucumbers and onions onto two plates. 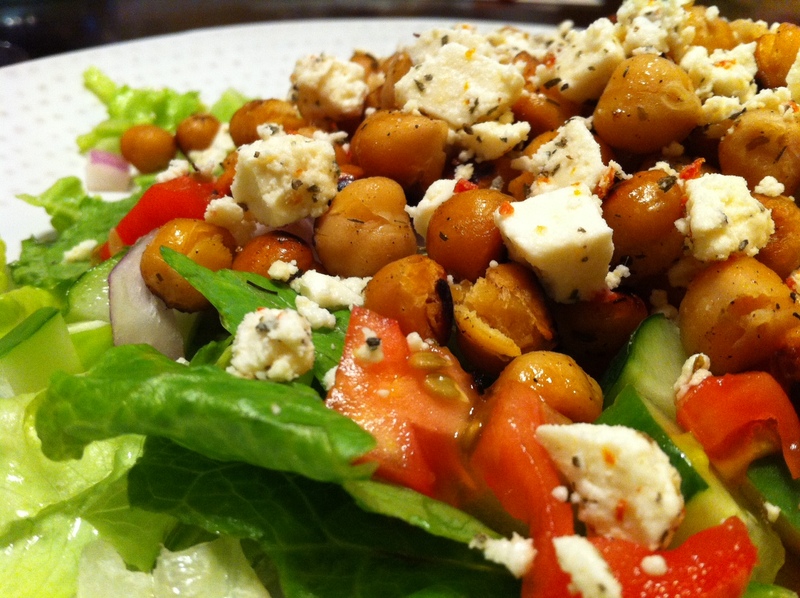 Top with cooked chickpeas. 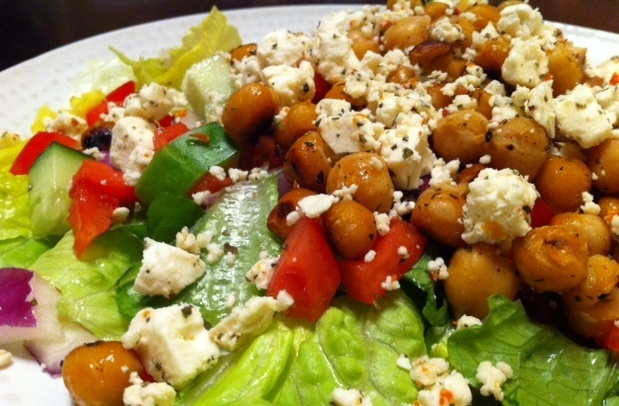 Sprinkle with feta cheese. And then drizzle with balsamic vinegar. So healthy, filling and delicious! I added the balsamic vinegar as an afterthought because it tasted like something was missing. It was just what the salad needed. I may try adding it to the chickpeas instead next time. Salmon was on sale at Publix so I picked up a filet at the end of last week. 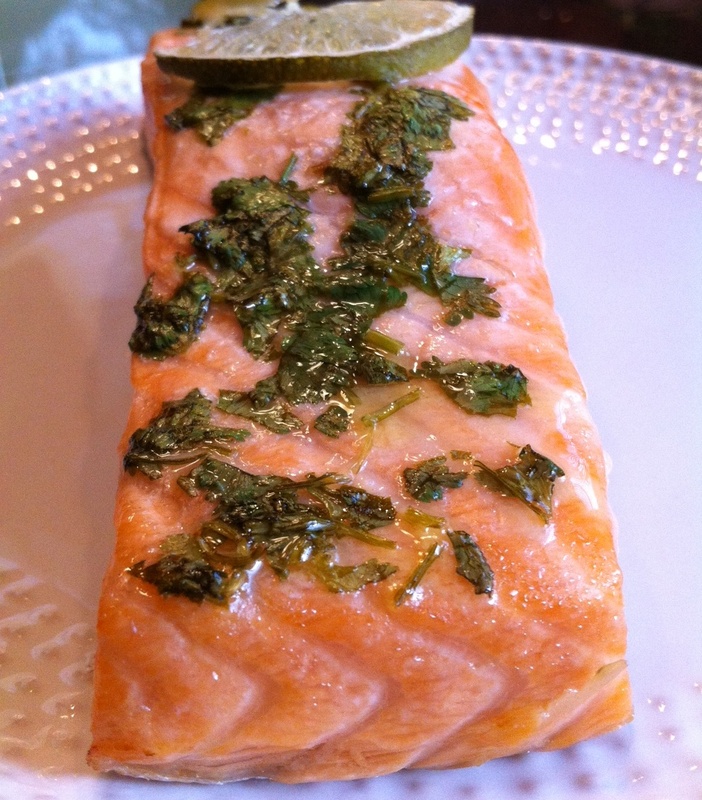 I’ve cooked salmon once before and it was rather easy, quick and quite good. Like most things I cook, I start with a google search. 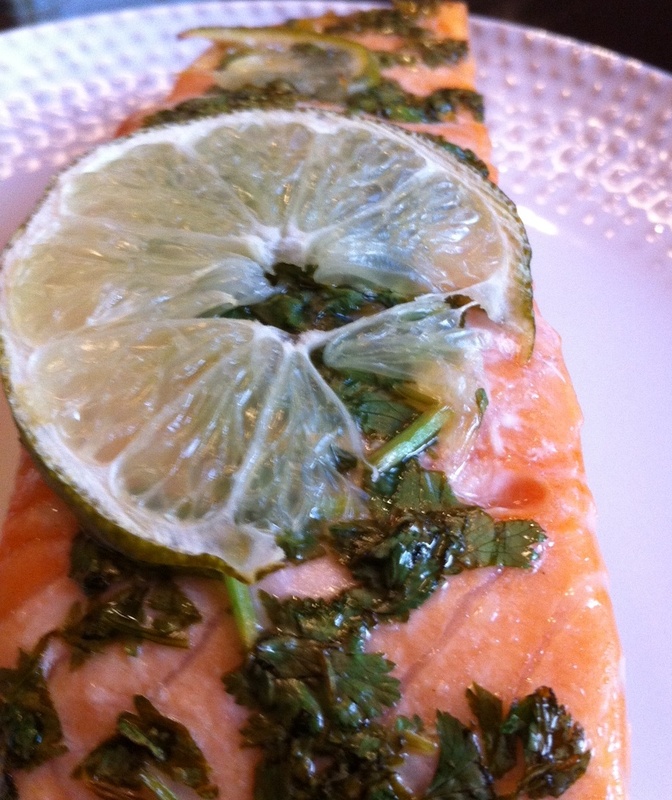 I had some limes (also on sale at Publix) and thought they might pair well with salmon since lemon does. Here’s the recipe I found using what few ingredients are in my kitchen. And of course, I had to sway a little from it since I only had one large filet and didn’t feel like cracking open garlic. Lightly grease glass baking pan with some of the olive oil. Place salmon inside. Combine cilantro, olive oil, lime juice and salt. Pour over salmon filet. Bake for 10 minutes. Place lime slices on top of filet. Bake another 2 to 5 minutes. Makes enough for two, but of course I ate the whole thing with a side of leftover chickpea salad. 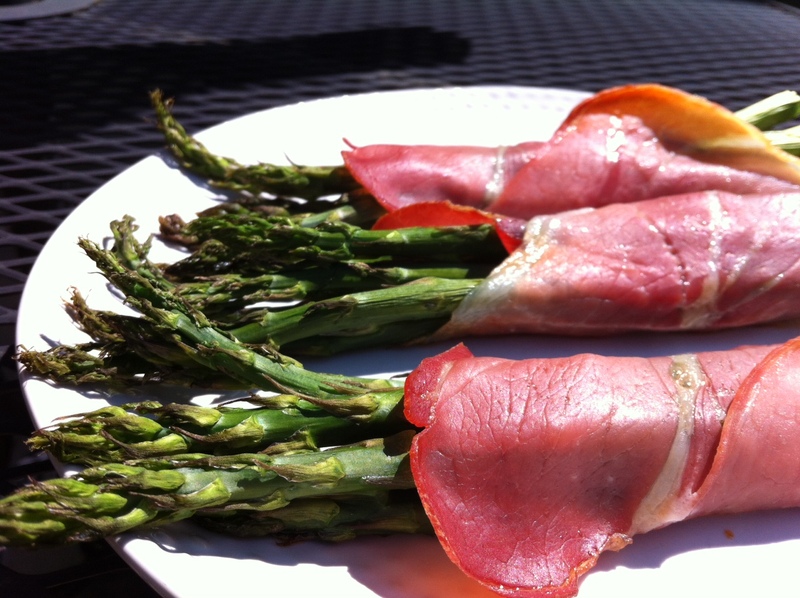 I stumbled across a recipe for prosciutto-wrapped asparagus on Pinterest last week and thought they’d be perfect for Easter. Since prosciutto is such a fatty, salty meat, I didn’t add any salt or olive oil. But I am trying to keep things light(er). The asparagus tips got a little dry so you may want to lightly coat them with olive oil. 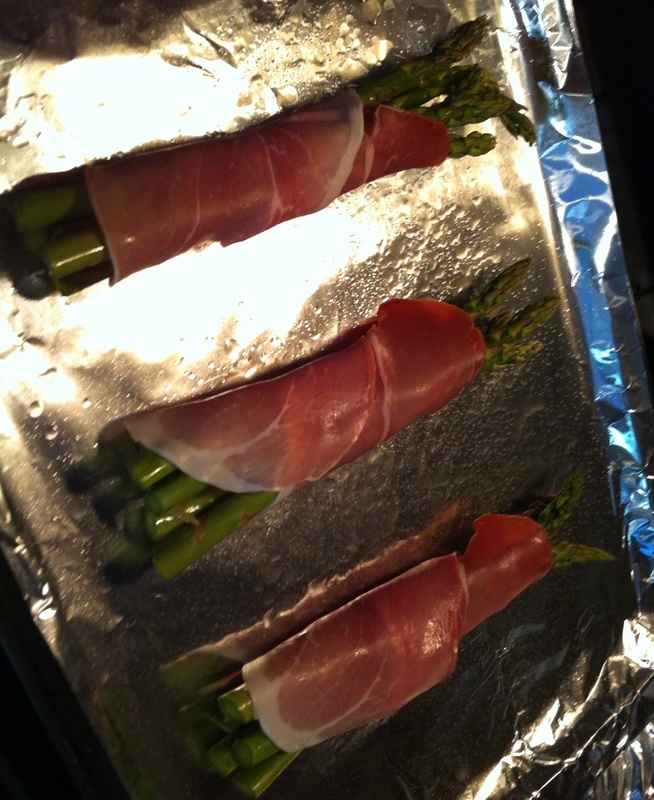 Divide asparagus evenly into six bundles (or however many slides of prosciutto you have). Splash with balsamic vinegar. Wrap prosciutto slices around each bundle. So good! And just enough meat for a lunch meal for me. Of course, now I can’t find the original link (the recipe was so simple I didn’t bother to pin it or refer back to it). While looking for it to include in this post, I found a lot of variations. Some included sprinkling each bundle with Parmesan cheese while others covered them in a cheese sauce using Philadelphia Cooking Creme. All sound simply delicious. 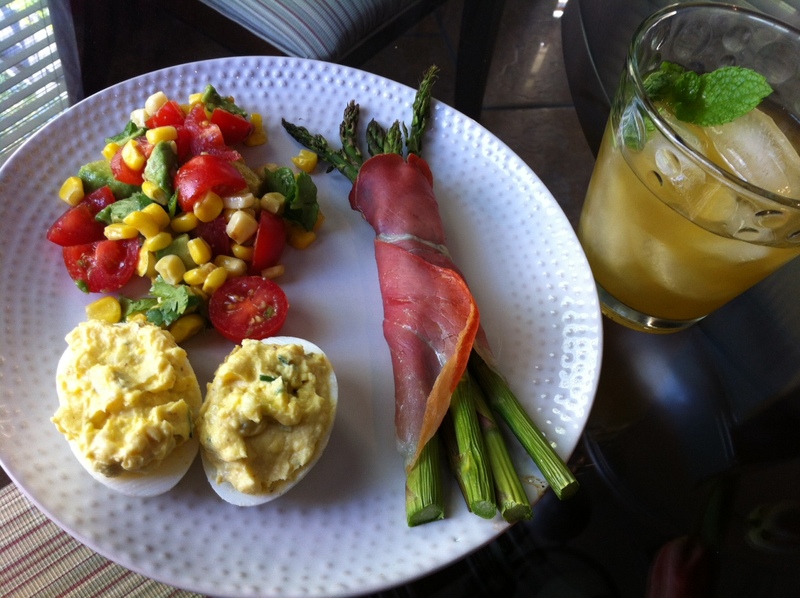 I served it with a corn, avocado and tomato salad (recipe to be in a later post), deviled eggs and mint green tea. It was a perfect spring lunch on a sunny, warm Easter day here in Tuscaloosa! Time for some spring sprucing! I love this time of year, even though it’s technically not spring yet, it sure does feel like it. And it’s spring break in Tuscaloosa — even for me! Since most grown-ups have to work, I get one week to myself. I’ve dubbed it #midlifespringbreak. It’s dedicated to home improvement, cleaning, cooking, sleeping and drinking. My father is retired military so I asked him to come down for a day and help me build a bookcase in my upstairs landing. It’s actually an extra wide hallway. My book collection is slowly growing, as I’m in a book club (Tuscaloosa’s Coolest Book Club or TCBC) and a lot of people are giving me books as gifts lately. Note, I often try to use the public library for book club books but sometimes that’s not possible. Take this year. We read The Hunger Games trilogy and there were loooong waiting lists for those books. I have a spare bedroom that I have as an office (with a twin bed just in case I have lots of visitors one night) in addition to a guest bedroom. I would eventually like to turn my office into a dressing room. That sounds extravagant but I have two reasons for doing this. One, I never use the office. I work in an office all day. The last thing I want to do is go home and spend more time in one. Because of this, it’s wasted space. And I really think you should utilize space if you have it. OK, so more on the dressing room later, when I can save up enough money for it! Back to the book case. 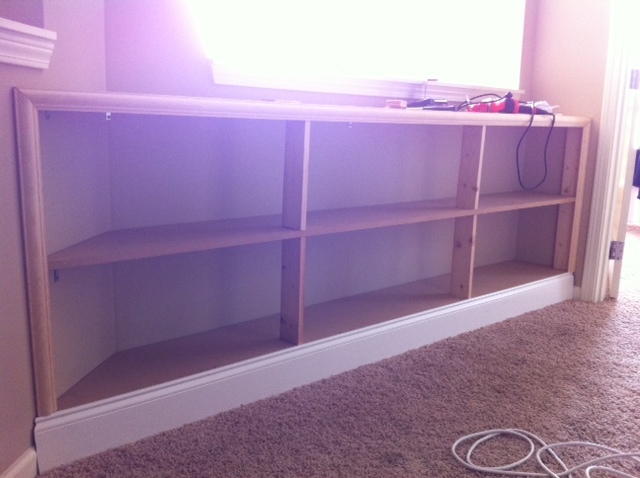 It took us less then 24 hours to design, shop for supplies, cut the wood, mdf and moldings and build it. 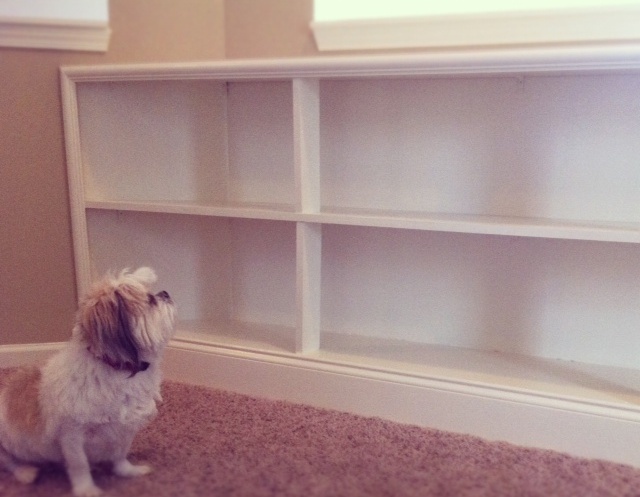 Little Liam inspects the newly built book case. Painting took a couple of days as I needed to prime and paint two coats. Most of that though was waiting for it to dry enough to put on the next coat. I had some trim paint leftover from when I first moved in and built a shelf for my TV but I needed to go to Sherwin Williams to get some more. Since I bought my house brand new and the painters used this store, they have my colors on file. This has proved helpful during the past five years. 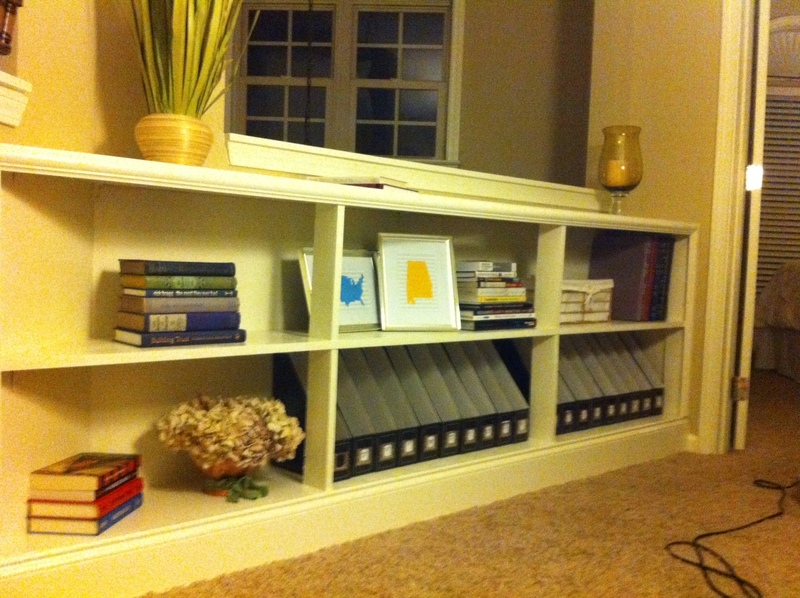 The total cost for this project was less than $100. A bargain! 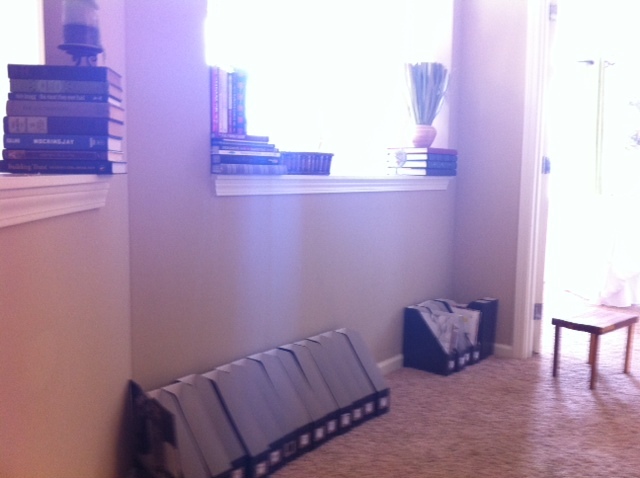 The book case is about 8′ long and 3′ tall and looks like it’s been there forever. And can’t wait to build more things with my dad!